The Nashville Farmers’ Market features a vibrant mix of local and visiting musicians. 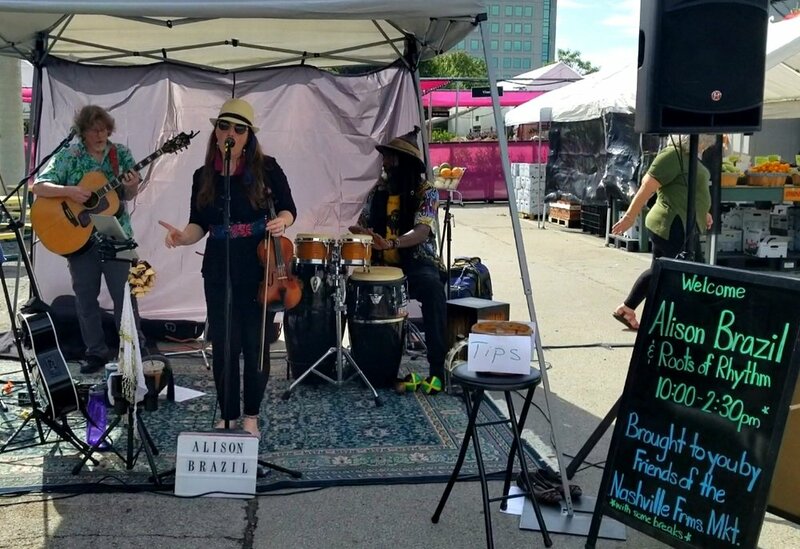 Thanks to the generosity of the Friends of the Nashville Farmers’ Market, we hire musicians for NFM, the Vanderbilt and Azafran Park markets, and festivals and special events. Music buskers are permitted when space allows and must check in at the Market information booth to be assigned an area if available. If you are interested in performing at the Market, please complete and submit the form below and a member of our team may contact you about performance opportunities. Submit your application by April 15. Performance dates sometimes become available if scheduled musicians are unable to perform, so any applications received after this date will be added to our waitlist. Buskers are not permitted to use electronic amplification or play/sing in a loud and disruptive manner that impedes communication between vendors and customers. The performer is responsible for providing a sound system and other equipment. We are a rain, sleet, snow and shine market, so the show must go on! You may sell CDs, and you are welcome to put out a tip jar. If not, how much space do you need? We reserve the right to cancel or suspend any performance. Thanks for your application. We will be in touch if we have a slot for you.